What is this picture saying to tourists? 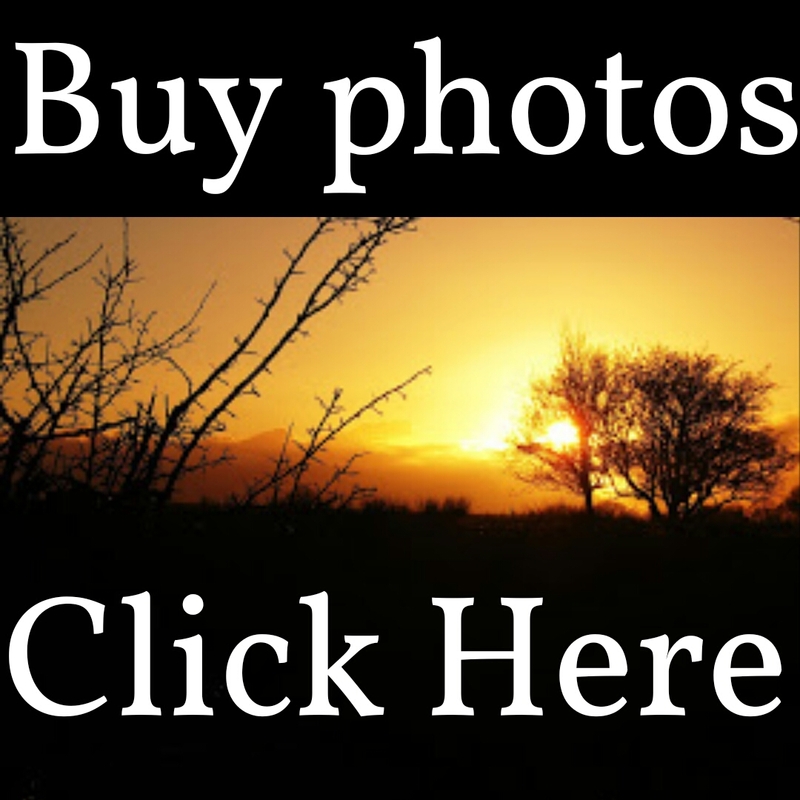 This picture was taken on the "Sarsfield Ride" near Newport in Tipperary. 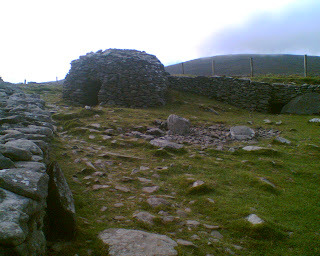 This is along the route that Patrick Sarsfield the 1st Earl of Lucan took when he captured a Williamite convoy of military stores in a bold attack. 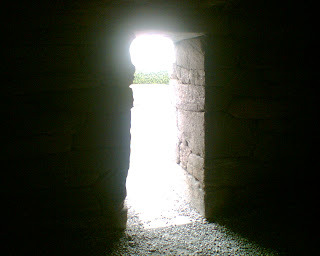 This lead to a prolonged siege of the city of Limerick to the winter and the English had to give up. this is Mary Wards in Kiltulla, not only is it a postcard looking pub it has one of the nicest pints of Guinness in Galway. 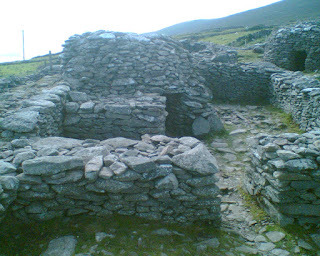 It is a real old fashioned place stone floors, open fires. I know that we are portrayed as an alcoholic bunch, but the social side of the local bar in the country side is very important. Old age should burn and rave at close of day;Rage, rage against the dying of the light. This is Charlevile Forest Castle in Tullamore county Offaly, this supposed to be one of the finest examples of 19th century architecture in Ireland. 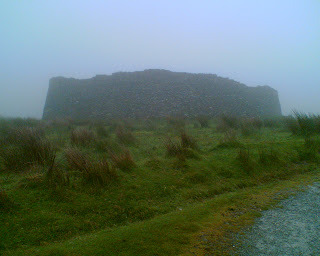 As you can see not a lot can be seen from the road. 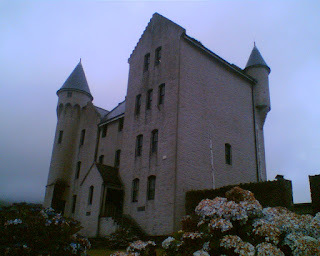 Emyvale in Monaghan is the furthest town north in Monaghan and was the stronghold of the McKenna Family. Emyvale lake is well known among anglers One thing I noticed about the tree lines in north Monaghan there seems to be a variety of tree's. red sky in the morning shepards warning! Old Border Crossing.Monaghan Armagh Border. During the "Troubles" in Ireland 35 bridges were blown up between the border of Rep. of Ireland and Northern Ireland. This one survived, some of the older bridges along major crossings were bypassed in favour of newer bridges, this is one of them. Patrick Kavanagh wrote about Monaghan "O stony grey soil of Monaghan the laugh from my love you thieved; You took the gay child of my passion and gave me your clod-conceived". I read this poem "stoney grey soil" and the book "Tarry Flynn" when I was in school. In his poems you could see feel inner conflict with his mind fighting with his environment, the weather here has not helped me shake his view of the scenery along the route, It was too wet to get pictures of the lake along the route and has been generally depressing, but I'm sure if the weather was different I would have a different opinion. This bridge looks like it used to be on the route between Monaghan town and Clones but now lies abandoned, the track of the road has been ploughed into the fields and this is all that remains. Foal playing peek-a-boo in the long grass just outside Monaghan town. 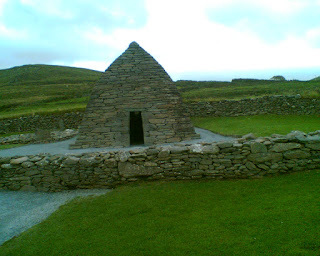 Before you start to look here I will highlight that in the Dingle area of Kerry there are 2000 archeology sites in the Dingle area alone in Kerry, so if I have left out some sites that I could not get too! 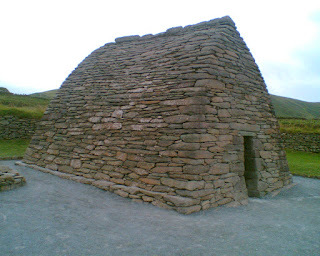 This is Gallarus Oratory in the Dingle area of Kerry, this is the most westerly point in Europe. 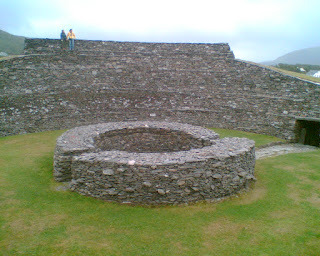 It is supposed to have been built as early as the 6th century or the 9th Century, there are some differences of opinion. the sloping design makes the building strong and keeps the inside dry. 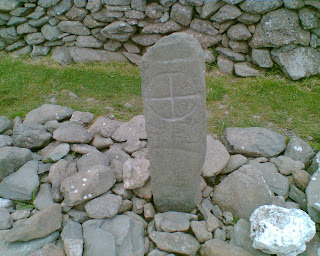 This is a cross that stands beside the oratory This is Leacanabuile Stone Fort near Caherciveen this was built in the 9th or 10th century and was the home of a rich farmer, the entrance is on the east side as it is on a hill and is open to the elements, the circular building in the middle is the house. 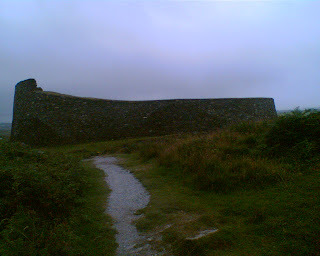 The walls of the fort are 3 metres in thickness and there are steps up to guard fort and as a lookout. I made sure to get people in the pictures to give perspective of heights. 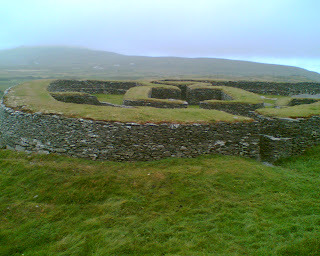 This is Cahergall fort and is older again from the 5th century BC or the 4th century ad, it is hard to date. 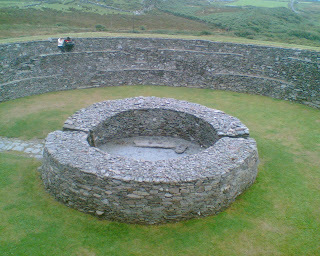 at This is Staigue fort and is further south on the ring near the village of Sneem, it is popular with tourist's as the Bus stops here on the ring of Kerry, but there are better examples in Dingle, but that is just of the Ring that the daily bus tours don't always get to. I was probably not impressed that you paid a contribution to the guy that owns the land for upkeep and there was animals in the fort and sh!t everywhere. 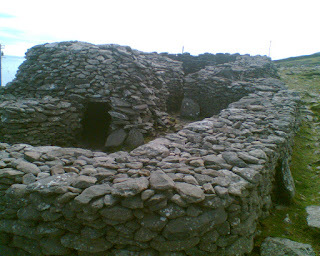 From an archaeological point of view is supposed to be 2500 years old and is a good example of dry stone wall building of that era. 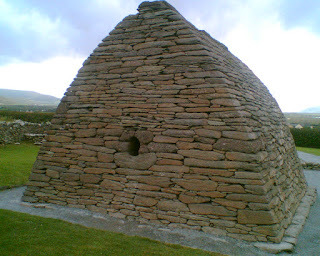 These Beehive huts are on the Dingle peninsula these are difficult to date as corbel roofs have been in existence in Ireland since newgrange 3100BC and these huts have been used up to the 20th century as storage and for small animals such as sheep. 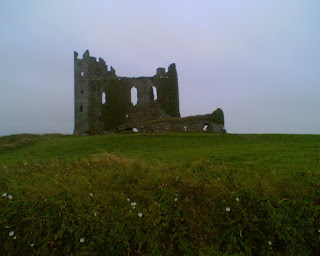 This is the remains of Ballycarbery Castle it is just down the road from Leacanabuile fort This is the old British barracks in Caherciveen it is unusual with turrets but the story that it was built to a design supposed to be for India is probably false as this is a common myth in many of British built castles around Ireland.